I purchased a Fitbit Charge HR to help keep me active. 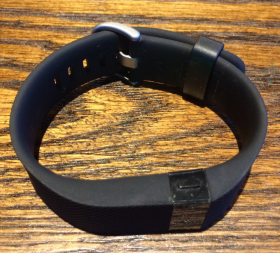 I’m a bit of a tech geek and follow the fitness wearable industry very closely. I’m also an engineer, so I like data. At Sparx, we are very familiar with fitness wearables. We are currently working on the design and fabrication of a unique fitness gadget for high-end athletes, the BSX Insight (https://www.bsxinsight.com/). 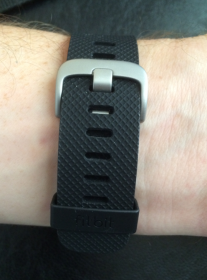 After a few weeks of use of the Fitbit Charge HR, here is my review. In the past I have used the Fitbit One, Fitbit Flex, and the Fitbit integration on my iPhone to track my activity. I also routinely track all of my meals on MyFitnessPal and have utilize the MyFitnessPal/Fitbit integration for about 3 years now. These two tools are a great way to control your diet and exercise routines. Logging your food intake is a great way to make you think about your food choices. Activity tracking is beneficial because you can get “credit” for all activities that you do during the day, not just intended exercise. This “credit” is in the form of burned calories. If you take the stairs at work, go on a long walk, run, bike, or play tag with your kid at the park, you get activity credit. This credit can be a way to meet your personal activity goal or justify that extra scoop of ice cream. It takes the guesswork out of the balance between eating and exercising. 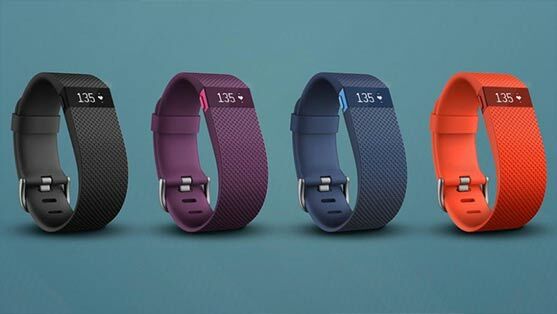 The Fitbit Charge HR comes in 4 colors and 3 sizes. The colors are black, plum, blue, and tangerine. The sizes are Small, Large, and XL. Black is really the only way to go for me. For something that I am going to wear all of the time, it needs to look “ok” or unnoticeable (tangerine is such a weird option). The Large size will fit most people. Since the Charge HR has a traditional watch band clasp, there are 10 different settings per model. The free loop will keep the excess band from flopping around. 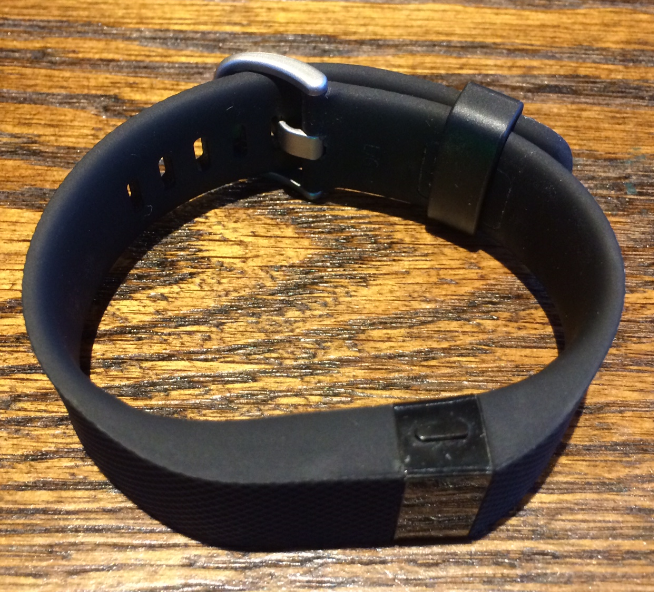 The material for the band is sleek and smooth rubber that seems very durable. It is very light, has a low profile, feels good on my arm and cleans easily. The watch style clasp works well and I definitely don’t worry about it falling off, unlike the Fitbit Flex or Fitbit One. Most of the time I don’t even realize that it is on. The screen is bright and easy to read even in the sunny outdoors. It is also useful as a flashlight if you are trying to navigate through your sleeping toddler’s room without stepping on any loud toys or running into a wall. The screen lights up only when you press the button on the side of the unit or double tap the face of the unit. It will stay on for about 4 seconds and then turn back off to conserve battery. 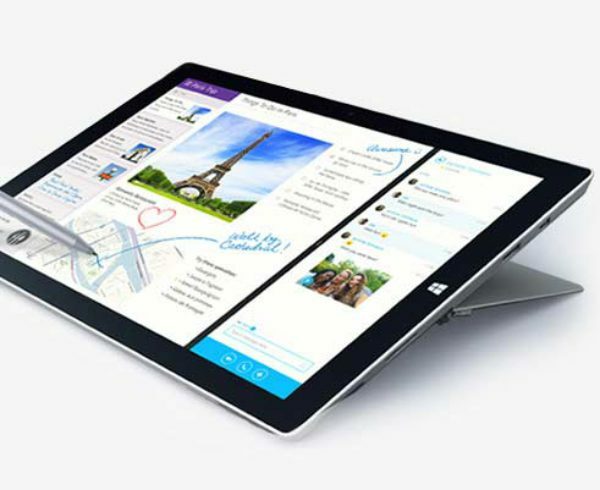 The material of the screen is plastic, so it will, and has, scratch easily. This is a little frustrating. For something that is designed to be worn all of the time, it is a bit fragile. On a full charge, the Charge HR will last about 4-5 days with constant wear. I’d say that this is acceptable since it is constantly monitoring your heart rate. Personally, I charge it about 10 minutes per day during my morning routine. This quick 10 minute charge keeps the battery full. The Fitbit Charge HR is not designed to be fully waterproof. You can’t swim with it on and shouldn’t wear it in the shower. We at Sparx Engineering know first-hand how difficult it is to make a truly waterproof electronic product that has a charging port and a button. However, this lack of waterproofing is a bit limiting. Swimmers should certainly steer clear of this device. Not being able to wear it in the shower is a little bit of a problem. I always shower after intense exercise. Your heart will stay at an elevated pace long after you stop working out or running. 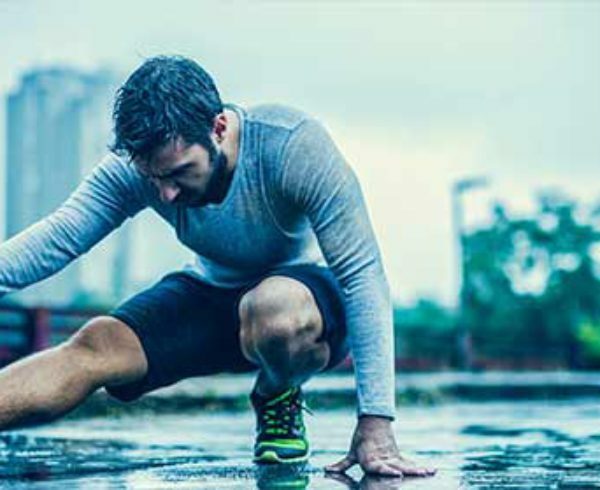 The ability to track your HR during the cool-down can give you a better insight to the full benefit of the activity. Taking the Fitbit Charge off for 10-15 minutes after a workout is basically hiding the benefit of the cool down from your tracking device. This is certainly not a deal breaker but something to keep in mind. The pic below illustrates the gap in HR data. However, you do need to take this thing off to charge from time to time. Since it can maintain full battery just by charging while I get ready in the morning, I’m ok with that. The Charge HR has the ability to set multiple silent alarms. When an alarm is due, the Charge HR will vibrate your wrist and gently wake you. This is a much better alternative to the traditional loud alarm clock. To snooze the alarm you have to double tap the front of the device. To cancel the alarm, you have to press the button on the side. The heart rate monitor is always on, constantly tracking your heart rate. It seems to be fairly accurate. 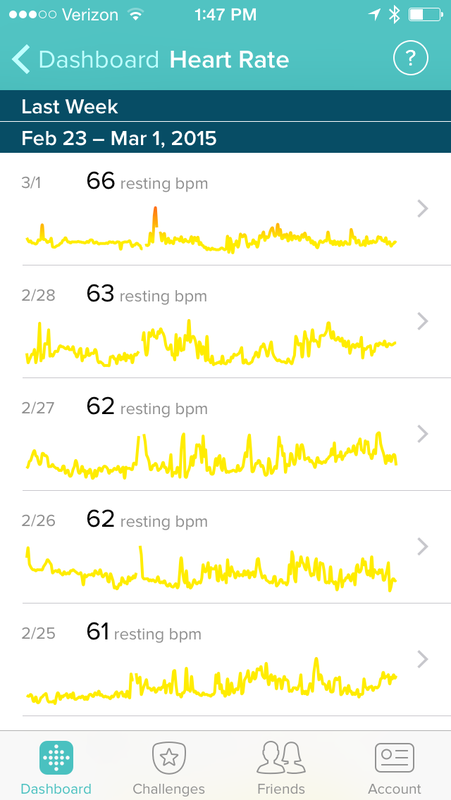 Taking your heart rate from your wrist is not as accurate as from your chest, like most HR monitors, but overall it seems on pace. The screen shows a beating heart next to your HR value and it beats at the same pace as your heart. This is a great way to check accuracy by looking at the beating heart and checking your pulse manually to ensure that they are in sync. 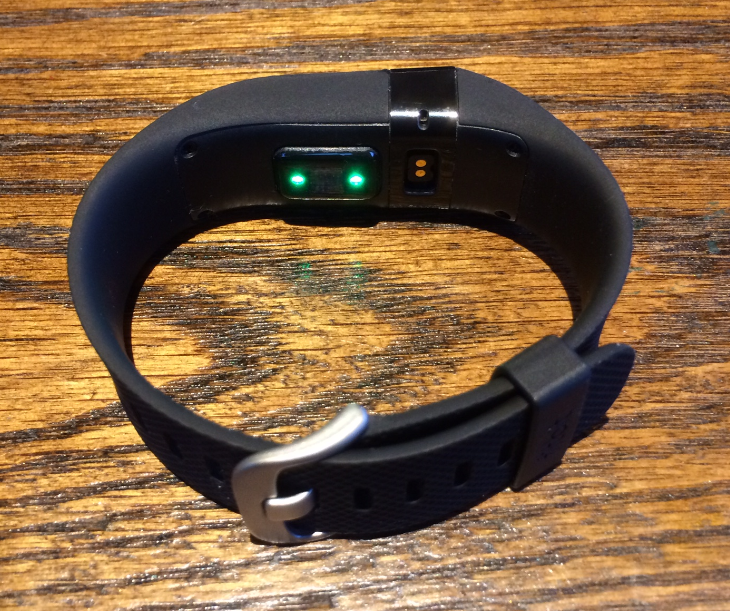 The Fitbit Charge HR monitors your heart rate with continuously flashing green LEDs. The wavelength of the green LED has been proven to be the most effective at monitoring heart rate (http://www.ncbi.nlm.nih.gov/pubmed/24110039). 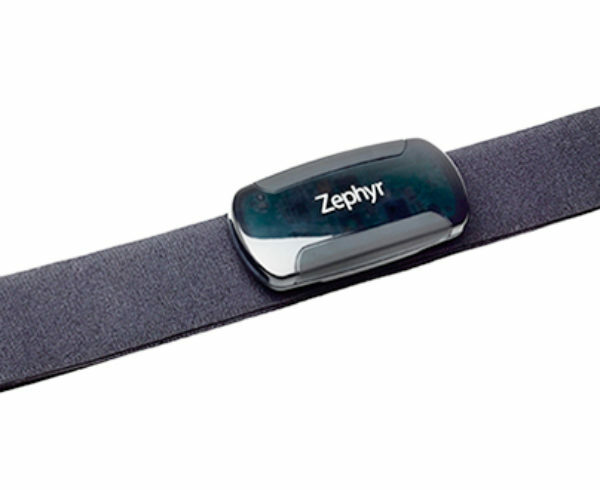 All-day tracking of your heart rate is something new to most people. This type of data insight can open all kinds of doors to viewing your health data. My resting heart rate is significantly higher at the beginning of the week when compared to the weekend. My stress levels are certainly higher on Mondays when I have to plan out and accomplish a week’s worth of tasks. You should even be able to predict when you are getting sick if your resting HR starts to elevate over a few days. For me, there are 3 beneficial uses for the HR data. The first is for seeing your HR during exercise to determine if you need to turn up or down your effort. The second is to more accurately track daily activity and exercise, instead of just using steps. The third is to see how my resting HR changes over time. Regular cardio exercise will reduce your resting HR. The Charge HR give me much more “credit” than previous Fitibit devices that I have used. Now I get almost a 1000 calorie “credit” for achieving around 10,000 steps in a day. With the Fitbit One and Flex, this value was much lower. But, those devices didn’t track all of the data that the Charge HR is able to. The Flex only counted steps, not stairs or heart rate. The One tacked steps and stairs, not heart rate (and I would forget to wear it all of the time). I kind of feel that the reported calorie count is a bit too generous and much more that what I am used to. This doesn’t mean that I can go out and eat a bunch more junk, I just need to adjust my intake goal to fit this new range. I guess that as long as your device is consistent, you can use it to modify your daily routine and achieve your fitness and weight goals to match it. Tracking sleep is automatic. The device assumes you are sleeping when you are not moving and your HR drops below a certain value. So far, this is a very accurate way to track sleep. I have not really seen any major miscalculations. I really don’t have any sleep issues except for not getting enough of it, so this data is not very useful to me. Pairing the Charge HR with your phone is quick and easy. The app is great and super simple. The main screen is a dashboard that gives you a summary of your day. If you track your food intake with MyFitnessPal, the “calories left” is very useful data in deciding what you can allow yourself to eat. 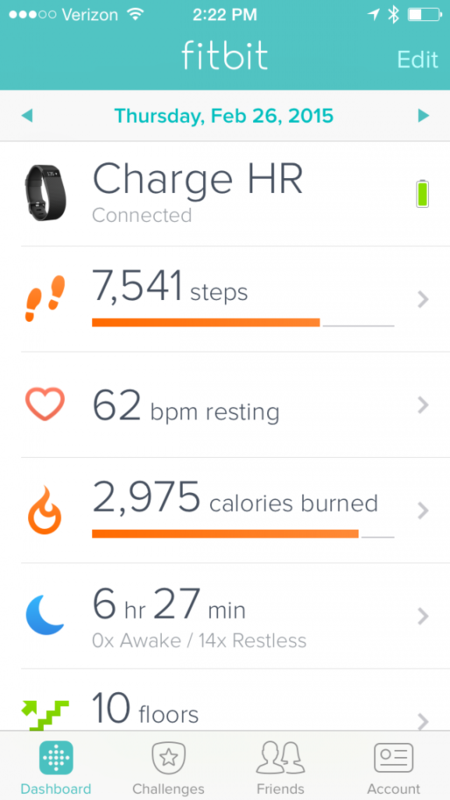 The Charge HR will intermittently sync data with your phone. When the app is open, it connects to your device and shows you real time data. Aside from the high level view, you can dive in and get all of your detailed data via charts from all of your logged data. Using the Charge HR and seeing all of the data that it can collect about your body and your health is like getting a glimpse of the future. 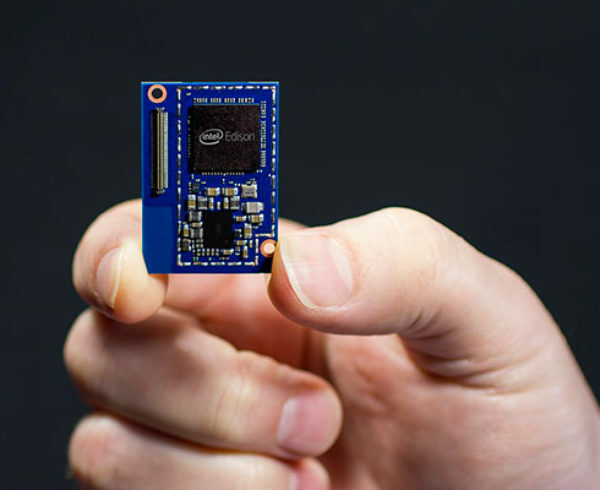 In the future, data such as steps, floors, HR, glucose level and many others will likely be monitored via a small implant that never needs charging. Until then, your best choice is probably the Charge HR. It gives a good glimpse of that type of data that we can track from our bodies to maintain peak health. It is also a great way to track your HR during an exercise to improve your cardio. I purchased my Fitbit Charge HR almost a month ago. Although the it does everything you would expect in a higher end device, I’m disappointed in the heartrate monitor for it’s accuracy. While working out with spinning or bootcamp activities, the watch always loses it’s connection and no heartrate is displayed. After a few communciations with Fitbit to move the watch, the watch down, tighten, loosen, and result, I’ll return the watch. 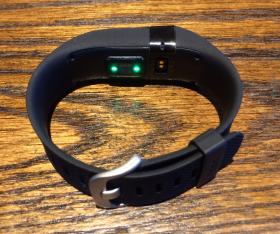 Although not wearing a band is great, not having heartrate displayed when working out, the watch will be returned. I have a Charge HR, and as a retired engineer and programmer, Currently exporting data from the dashboard provides a summary level file; example sleep shows the Total Minutes Asleep, Time in Bed, Minutes Awake, and Number of Awakenings for each day. Yet, the dashboard provides the detailed sleep for a day, showing when each awake occurred with respect to time, or each restlessness, etc. so the data is there somewhere. Having a Detailed Export option to get ALL of the data, in CVS or XLS I could create numerous additional analyses and charting to find overall trends. I have had two FitBit Charge HR units in the past 15 months. The charging band (that wraps around the FitBit and holds the charging cable in the unit) broke off my first unit within the first four months. FitBit replaced it for me. Just this morning, the very same thing happened to my replacement!! I never get it wet (save the sweat that gets under it when exercising, which is normal), charge it regularly, and take care of it. My Fitbit charge HR didn’t change to 0 steps at midnight last night. It continued on counting the steps from yesterday. What can I do to ensure it clicks to 0 at midnight? I was given a Charge HR in late 2015 and I thought great now I don’t have to buy one as it was definitely on my Xmas present for me list. After I set it up I was happy with the results until I used the fitness tracker and the GPS accuracy was absolute rubbish. After around 2 months there was eventually a sw update and that fixed that issue. The next issue was the band then started to bubble and to keep a long story short it eventually completely came free from the area around the display. As I was in the process of complaining to the customer service I received a push update which completely “bricked” the device. After a fair bit of jumping up and down I was finally sent a replacement, that was in October of last year, not even 12 months since the first one was set-up. Things were looking rosey, the device has been working well except for its HR monitor which provides me with garbage reading all the time. I have checked this against my BT Polar HR monitor which is connected to my smartphone using the Sports tracker application. The Charger HR is always telling me that my heart rate is a good 20~30 bpm higher than the polar. Around 6 weeks ago I noticed that the band is again starting to peel adjacent to the display. It is also starting to bubble further down the band. It contacted customer support and advised them of this and requested another replacement. They came back to me ad advised that the warranty on the original is over and the replacement has no warranty. I saw red on this one and threatened them with taking them to my local consumer law people and they finally relented stating that they will not replace this new one if anything goes wrong. The issue I see at hand is a major design law in the material used for the band and the way it is mounted to the electronics module. The material seems to start to stretch and this leads to it peeling. I have been involved in the consumer electronic industry for well over 30 years and I have to say the attitude of FitBit leaves a lot to be desired. All I can say is thank God the country where I live has very strong consumer protection laws and those rules in a lot of cases will override the manufacturers warranty period. All I can say id be careful when deciding which personal fitness device you are going to purchase. After my experience I would never actually outlay my own money on any device manfactured by Fitbit. I have had 3 Fitbit Charge HR devices over two years. The first one lost its ability to sync. The first warranty replacement band began to bubble and peel. The second warranty replacement band has peeled away from the unit. I purchased a Fitbit Charge HR in December, 2015. It stopped working in roughly 6 months – would no longer sync or charge, I received a replacement and it too lasted about 6 months. I contacted Fitbit and have tried to work though the issues. The battery on the replacement will no longer hold a charge for one day. I contacted customer service again and learned that the warranty on applies one year from from the original purchase. Accordingly, there was nothing that could be done. However, the representative was willing to “push” to get me a 25% discount on a new tracker. So both trackers I owned both worked worked for six roughly months but Fitbit wanted me to buy another Am I missing something? Why in the world would I pay for a new tracker, even with a 25% discount, when the product failed to perform. No thank you. 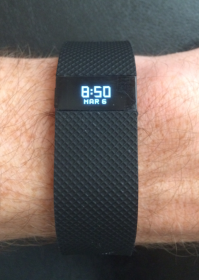 I strongly suggest that anyone considering buying a Fitbit get insurance if you can. The performance of the product is a joke based on my experience.